DIP socket, 22pin, 2.54mm rack, for integrated circuits IC socket with 22 pins plastic black. List Price: 0.20лв. VAT Incl. DIP socket, 6pin, 2.54mm rack, for integrated circuits IC socket with 6 pins plastic black. List Price 0.15лв. VAT Incl. 0.13лв. VAT Incl. 0.11лв. VAT Incl. 0.09лв. VAT Incl. 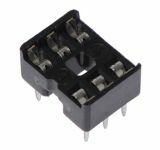 DIP socket, 8pin, 2.54mm, for integrated circuits IC socket with 8 pins plastic black. List Price 0.12лв. VAT Incl. 0.11лв. VAT Incl. 0.10лв. VAT Incl. 0.09лв. VAT Incl. DIP socket, 14pin, 2.54mm rack, for integrated circuits Socket for IC with 14 pins in DIP configuration. List Price 0.15лв. VAT Incl. 0.14лв. VAT Incl. 0.12лв. VAT Incl. 0.11лв. VAT Incl. 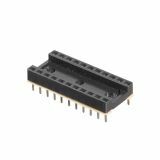 DIP socket, 16pin, 2.54mm rack, for integrated circuits IC socket with 16 pins, plastic, black. 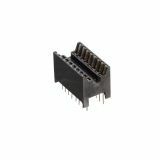 DIP socket, 16pin, 2.54mm rack, for integrated circuits IC socket 16-pin plastic black. List Price 0.30лв. VAT Incl. 0.28лв. VAT Incl. 0.26лв. VAT Incl. 0.24лв. VAT Incl. DIP socket, 18pin, 2.54mm rack, for integrated circuits IC socket with 18 pins plastic black. List Price: 0.40лв. VAT Incl. List Price 0.25лв. VAT Incl. 0.23лв. VAT Incl. 0.21лв. VAT Incl. 0.19лв. VAT Incl. List Price: 0.30лв. VAT Incl. List Price 0.60лв. VAT Incl. 0.57лв. VAT Incl. 0.54лв. VAT Incl. 0.51лв. VAT Incl. DIP socket, 24pin, 2.54mm rack, for integrated circuits IC socket with 24 pins plastic black. List Price: 0.60лв. VAT Incl. DIP socket, 24pin, 2.54mm rack, for integrated circuits IC socket 24-pin plastic black. List Price: 0.65лв. VAT Incl. DIP socket, 24pin, 2.54mm rack, for integrated circuits Test socket for THT mounting with 24 pins. List Price: 1.99лв. VAT Incl. DIP socket, 28pin, 2.54mm rack, for integrated circuits IC socket with 28 pins plastic black. DIP socket, 28pin, 2.54mm rack, for integrated circuits Test socket for THT mounting with 28 pins. DIP socket, 32pin, 2.54mm rack, for integrated circuits IC socket with 32 pins plastic black. 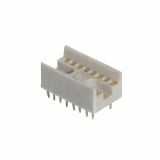 DIP socket, 42pin, 1.778mm pitch, for integrated circuits IC socket with 42 pins plastic black. List Price: 0.85лв. VAT Incl. DIP socket, 40pin, 2.54mm rack, for integrated circuits IC socket with 40 pins plastic black. List Price: 1.40лв. VAT Incl.